When the 2.5-litre Tasman Formula replaced libre racing in Australia and New Zealand in 1964, it was officially known in Australia as Australian National Formula (ANF) or later Australian Formula 1 (AF1). Two other categories were introduced alongside ANF: ANF1½ for 1500cc cars and ANF2 for 1100cc cars. ANF1½ was soon dominated by pushrod and twin-cam Ford engines while ANF2 was populated mainly by ex-Formula Junior cars, the category having just finished in Europe. In 1968, ANF1½ was more sensibly renamed to ANF2 (later AF2) and increased to 1600cc, the more normal capacity for the Lotus-Ford twin cams that then dominated the category. The old ANF2 was then renamed to ANF3 (later AF3) and was increased to 1300cc in 1972. From 1968 onwards, the Cosworth FVA, a 1600cc pure racing engine, started to appear in Australia and quickly took over ANF2. Local competition came from the Waggott TC4V engine but interest in the category was limited as nobody else could be competitive without one of these engines. For 1971, CAMS sensibly introduced a 2 valve per cylinder restriction which made the Ford twin cam once again the leading engine. 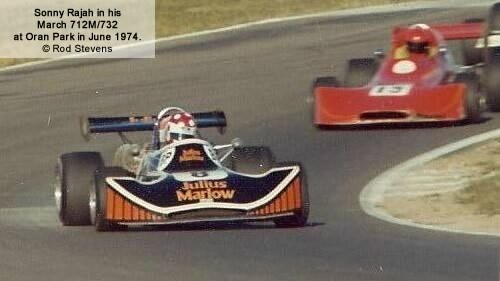 AF1 had meanwhile moved to F5000 and was thriving so the AF2 competitors had the chance to establish their own completely independent championship. This had a short but fondly-remembered boom around 1974 when the championship was sponsored by Van Heusen and attracted large and highly-competitive fields. Elsewhere in the world, the Ford twin cam was falling out of favour, with the UK (in 1971), Canada (in 1974) and the US (in 1975) allowing the Ford BDA into their Formula Atlantic championships. Macau introduced an almost identical Formula Pacific in 1975, and the New Zealanders then moved to F/Pacific in 1976, leaving the last country to focus on the Ford twin cam. Pressure to make the same move in Australia was resisted by the F5000 contingent, who saw a potentially successful F/Pacific as a risk to their own aged formula. CAMS fudged the issue by extending the current ANF2 rules for two more years up to 1978, when it was bizarrely replaced by a 1600cc single-cam category. Formula Pacific was finally allowed into the country in 1979, and took over the Gold Star series in 1981. The 1972 season: Calder, Hume Weir, Oran Park, Amaroo Park, Surfers Paradise, Symmons Plains, Adelaide International. The 1974 Van Heusen results were collated by Curt Bond but results for other seasons are proving more difficult to obtain.